Field Day with Manure Grassland Injector! Please join us to see our new grassland shallow slot manure injector in action! Veenhuis Euroject 1200 grassland injector. 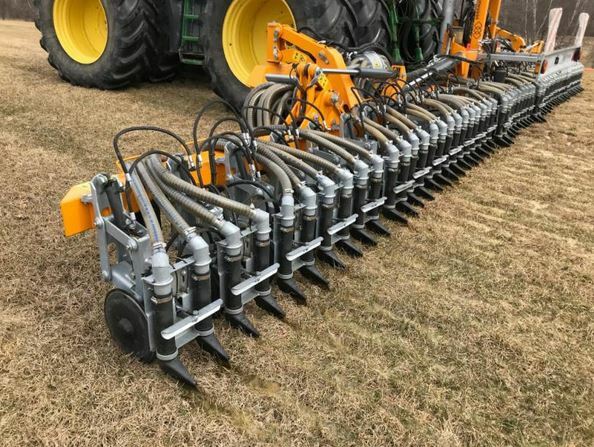 Hicks Sales LLC (Vermont Veenhuis dealer) will be on hand to talk about this technology and other models available in the United States. Eric Severy, Matthew’s Trucking, will share his experience and expertise with manure injection and talk about how the equipment works and what situations might be best suited for it. 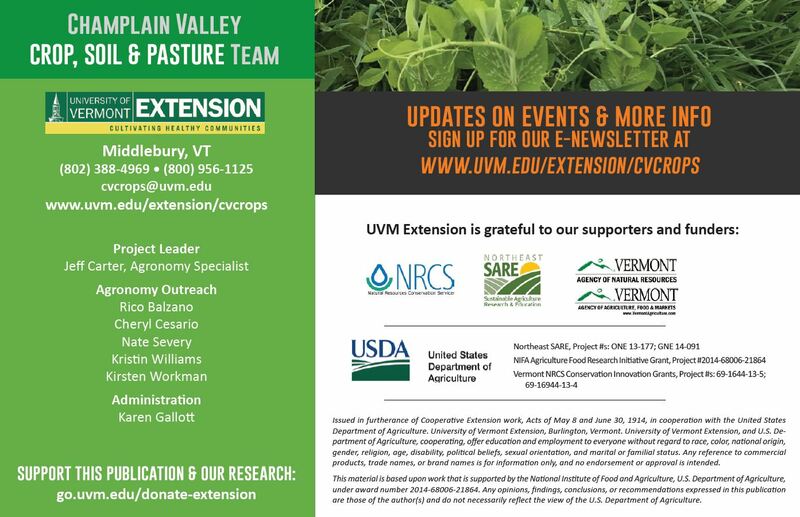 UVM Extension Agronomists will discuss the benefits of injection and how it can reduce runoff and increase yields. 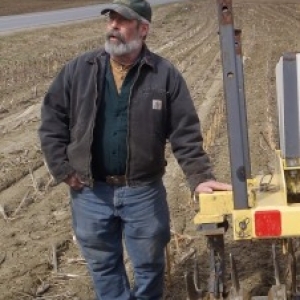 Farmers will share their experience using other forms of manure injection. Find out more about how to get this grassland injector on your farm. Or contact Kirsten Workman if you have questions or want more information. To request a disability-related accommodation to participate in this program, please contact Karen Gallott at 802-388-4969 or 800-956-1125 by June 6, 2018 so we may assist you. 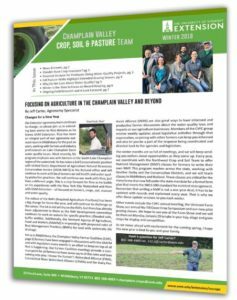 View Our Entire Newsletter As A PDF HERE! By Jeff Carter. Changes for a new year. Vermont Farm Show; Nutrient Management Planning; 5th Annual No-Till and Cover Crop Symposium; Organic Dairy Producers Conference; Farm Business Clinics. News and Event Info also on our blog page here. Should I Have Crop Insurance? By Jake Jacobs. Deciding if and what coverage makes sense for your business; upcoming deadline. By Tony Kitsos. 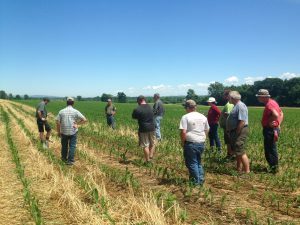 Opportunities still exist for farmers to receive assistance from Farm Business Planning on water quality projects. By Cheryl Cesario. 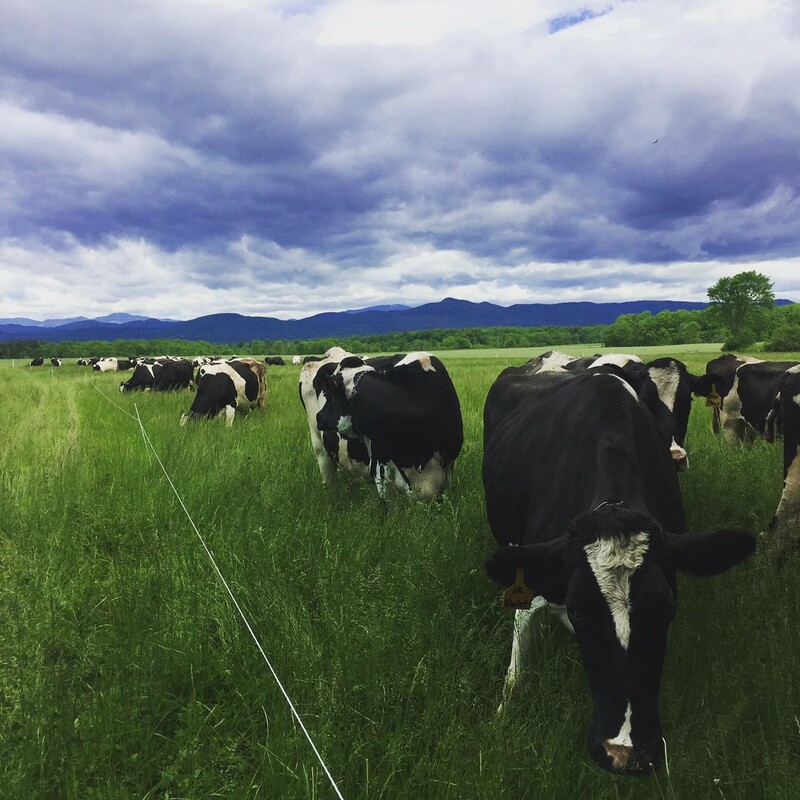 Two different farm pasture walks this fall addressed how local farmers approach management for extended fall grazing. Why Do We Care About Water Quality? Champlain Valley Farmer Coalition. 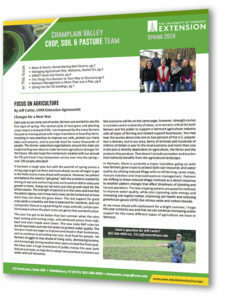 Why we care and how we engage other farmers and the community at-large in the conversation. Join to add your voice! By Kristin Williams. 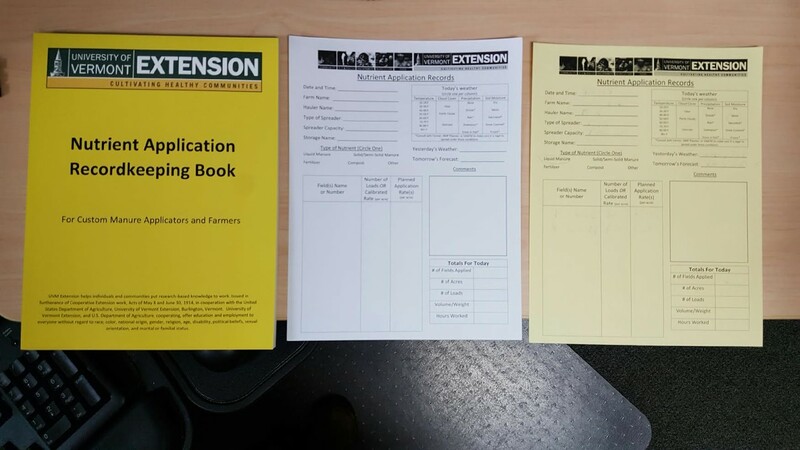 Good record keeping is key to effective decision making, both in the financial word and for nutrient management. By Nate Severy. A look at work we’ve been doing this past fall that continues into the new year, and planning for spring planting success. Spring 2017 started relatively dry, but Mother Nature has certainly made up for it, with above average rainfall in May, and the seventh wettest June in 100 years (National Weather Service, Burlington, VT). 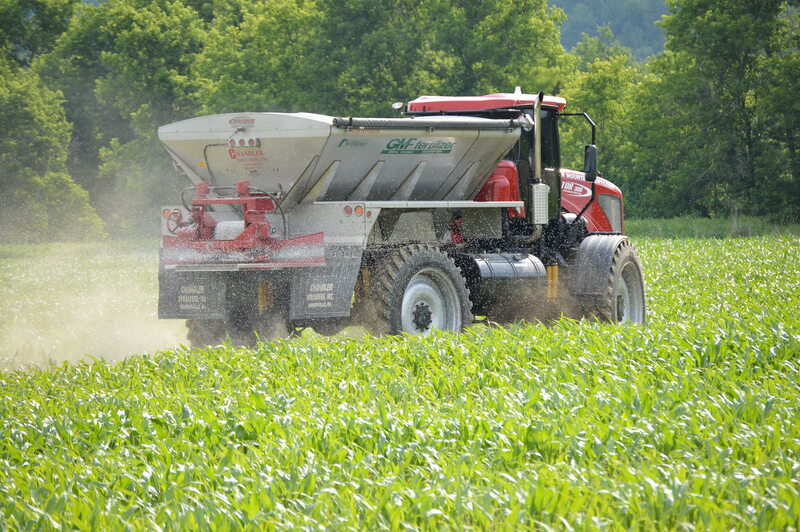 Applying nitrogen to corn, a process known as side-dressing. 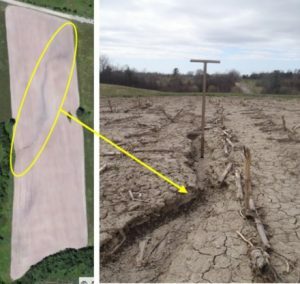 use of nitrogen, especially on soils prone to leaching. 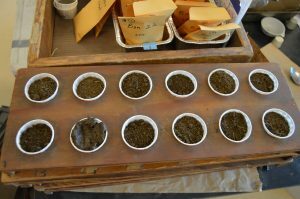 The good news is that the organic nitrogen in manure has been slow to mineralize because of the cool temperatures and will still be there as the season progresses. 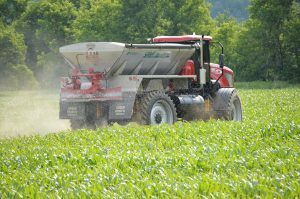 However, it is safe to say many farms will be sidedressing corn with extra nitrogen this year. Agricultural and Environmental Testing Lab. The old, reliable way to predict how much sidedress nitrogen to apply is the pre-sidedress nitrogen test (PSNT). PSNTs are simple and affordable ($6-8). However, they require effort and only offer a snapshot in time; they do not account for previous activity nor for future nitrogen mineralization. 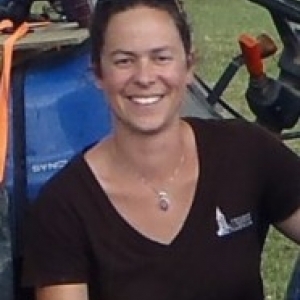 An alternative way to generate sidedress recommendations is Adapt-N software. Nitrogen is very dynamic in the soil so it is difficult to predict how much will be plant-available. 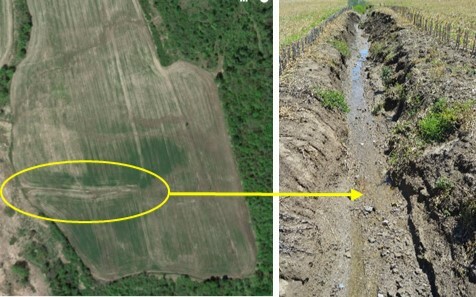 Therefore, it is necessary to have as much information as possible about fertilizer, manure, previous crop and soil type to generate a good recommendation with Adapt-N. You can also assess the nitrogen needs of corn using chlorophyll meters, active sensors and aerial imagery. 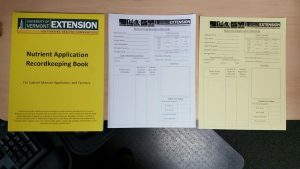 These can be effective when used properly, and local agricultural consultants can provide these services. PSNT is recommended for corn fields 2 or more years after a sod, and/or where manure rate is uncertain, or if manure application is not expected to meet corn N requirement. 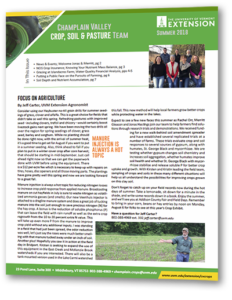 PSNT is not recommended in first-year corn after a grass sod; first-year corn after an alfalfa grass stand is plowed down; or if enough manure was applied to meet corn N requirement. based on PSNT results. Results are usually sent out within 24 hours since the information is time-sensitive. 12” – deeper than a regular soil test. fertilizer bands. Mix sample thoroughly. 4. 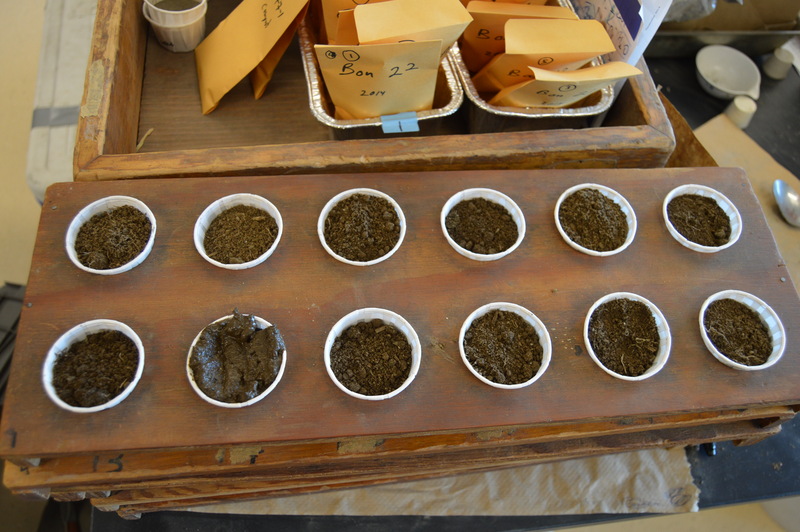 Air dry samples ASAP to stop further mineralization. 5. Submit samples in small plastic bag (about 1 cup). 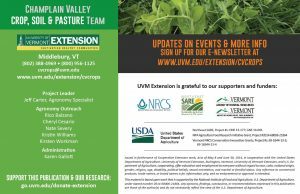 Farmers and UVM Ext. 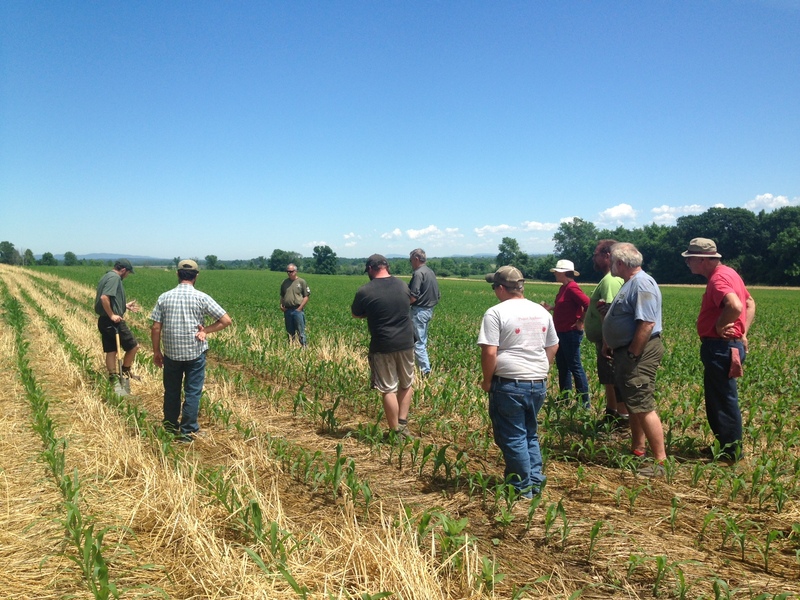 Professionals discussing new no-till corn at an early summer crop patrol. 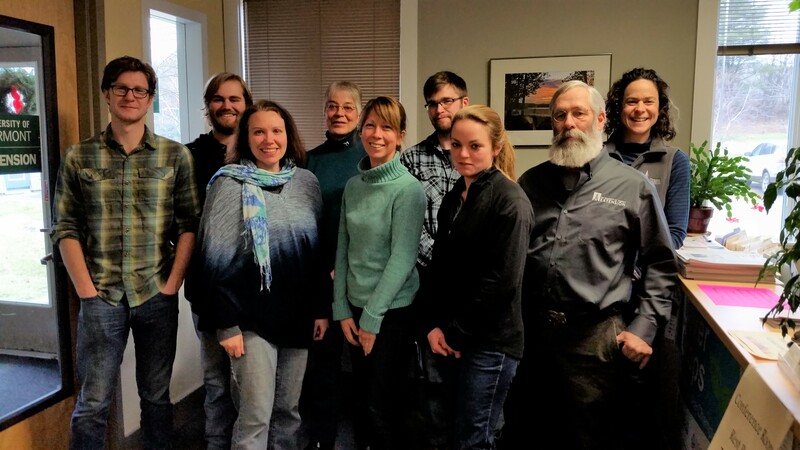 This has been a busy year for our Extension team in Middlebury. I prepared a summary for my boss, and during this past year we offered 72 workshops, conferences, classes and field day events and tallied 8,143 “educational contacts” who came to our programs. 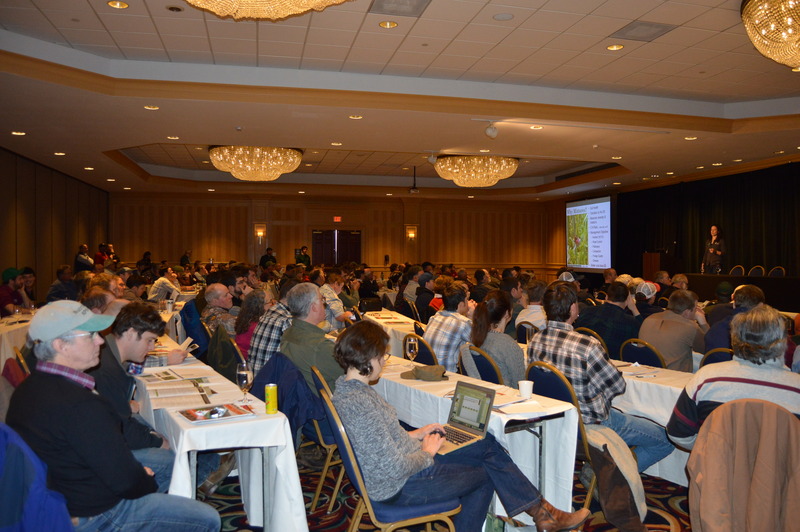 Many farmers and ag business members came to more than one event. We also provided 1,873 individual consultations this year for one-on-one education and production technical assistance. I hope you were able to be there. We have several new projects starting this fall and look forward to many more farm demonstrations with new cover crop mixes planted, no-till corn strategies, calcium sulfate (gypsum) and other soil health amendments, reducing compaction in clay soil, actual farm crop budgets and whole-farm mass nutrient balances. 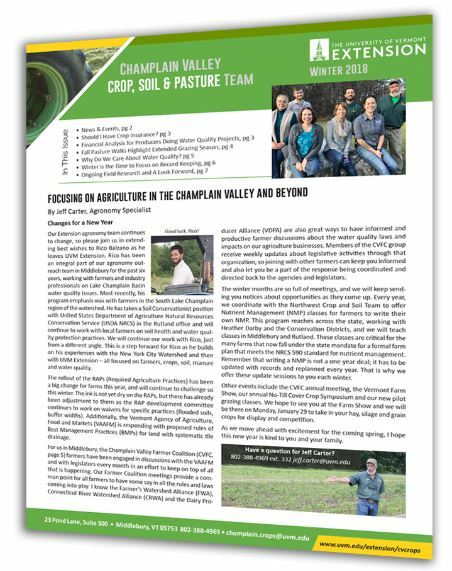 This winter will be just as busy with meetings and classes for no-till corn, cover crops and soil health, pasture and grazing, manure applicator training, nutrient management plans, updates on farm environmental laws, and regular meetings of the Champlain Valley Farmer Coalition. Our team work is funded through multiple grants and could not be accomplished without our supporters and funders.